Is Garibaldy responsible for the fall of Centaury Prime? Re: Is Garibaldy responsible for the fall of Centaury Prime? I did not think there were any indications Garibaldi was drunk during that part of the conflict. IIRC, he found out about the Narn and Drazi ships had pulled out of combat zones and presumably were headed for Centauri Prime and immediately notified Sheridan. Doesn't matter. By that time, the avalanche had already started. It an earlier episode , when he was supposed to help keep the Centauri and allied forces separated by sending in the White Stars that he was drunk. Right, when he possibly could have prevented hostilities from starting, he was passed out on the floor. 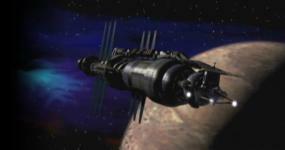 However, were those Centauri ships piloted by Centauri personnel or Shadowtech pods? If the latter, they'd probably have attacked regardless. I figured those were the Centauri ships with actual Centauri personnel aboard. As they were escorting a Centauri civilian ship and I presume it might've raised questions if the civilians had tried to contact their escorts and not received a reply. Personally, I doubt sending in a bunch of White Stars would've kept the war from breaking out. After all, the Centauri would've considered them as hostiles anyway and the Drazi would've probably attacked given that they would've felt the White Stars had to back them up.